The natural history of perivalvular abscess has become better understood, largely because of serial echocardiographic studies in these patients who undergo surgical intervention as well in those who only receive medical treatment [27,28]. These studies have showed that perivalvular abscess is a dynamic process and is the precursor of all other perivalvular complications, including perivalvular dehiscence, pseudoaneurysm, and fistula. Furthermore, perivalvular abscess has a predilection to the aortic root. The pathological definition of a paravalvular abscess is a region of necrosis with purulent material that does not communicate with a cardiac chamber or great vessel lumen . This is mirrored by the echocardiographic definition of abscess which is a localized abnormal echolucent area within the perivalvular tissue that does not communicate with the circulation (Figure 7.6) . 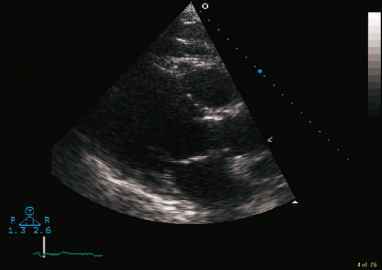 In addition to identifying the presence of an abscess, there are a number of surgically relevant features that can be delineated using echo. These include the maximum thickness of the abscess cavity, the circumferential extent of the abscess, and involvement of surrounding structures. Long axis views of the aortic root and ascending aorta can be used to define the maximum thickness of the abscess cavity. 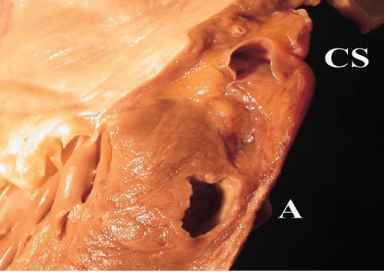 echo evaluation of abscesses in the setting of endocarditis has documented the development of pseudoaneurysm from abscess cavities [27,28]. Most of these pseudoaneurysms arise as a result of a connection between the aorta and the abscess cavity . A pseudoa-neurysm is an echolucent space with flow originating from either the left ventricle (LV) or aorta. This appears as a pulsatile echolu-cent pouch anatomically related to the valve annulus . When the pseudoaneurysm originates below the aortic annulus, the con nection is between LV and the pseudoaneurysm cavity and color flow imaging shows flow entering the cavity in systole from the LV (Figure 7.7) . Using the color flow jet as a guide may help to image the LV to pseudoa-neurysm connection. The maximum dimension of LV to Aortic discontinuity on 2-D imaging can vary from 1 to 24 mm . Figure 7.7. 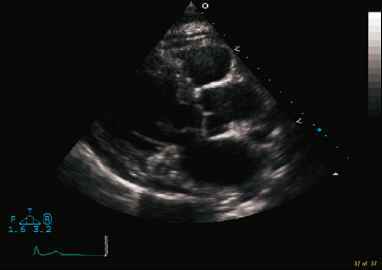 A pseudoaneurysm at the mitral annular intervalvular fibrosa on transesophageal echocardiography (A). Color flow imaging shows low velocity flow within the pseudoaneurysm communicating with the left ventricular outflow tract (B). are common and should be looked for in the follow-up of these patients. The clinical factors predictive of periannu-lar complications are listed in Table 7.7 [29,32,33]. heart failure due to dysfunction of the infected valve. Patients with periannular abscess have a high mortality whether or not they undergo surgery (Tables 7.8 and 7.9) [27-29,34-36]. In patients referred for surgical intervention, preop-erative echo is vital to plan the surgical intervention and provide guidance for operative risk. The range of operative procedures used to surgically manage periannular complications in patients with IE is discussed in details in Chapter 7. The circumferential extent of abscess and the presence of a fistula have been shown to predict increased operative risk . Hemodynamically significant aortic or mitral regurgitation increases operative risk in the setting of abscess . Patients who survive surgery for perrianu-lar complications of endocarditis are at continued risk for cardiovascular morbidity. 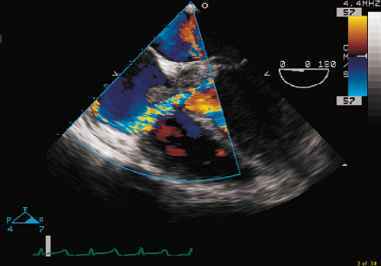 Perivalvular regurgitation is present in the majority of patients who have surgery for peri-annular complications of endocarditis. Patients operated on in the setting of aortic root abscess had a 78% rate of postoperative aortic regurgitation versus 26% in postoperative patients with endocarditis and no abscess . Perivalvular leaks causing symptoms or impaired LV function may necessitate redo valve surgery . Finally, recurrent or persistent infection can occur post operatively which in some cases requires further surgical intervention. transthoracic echocardiography, ND = not determined. 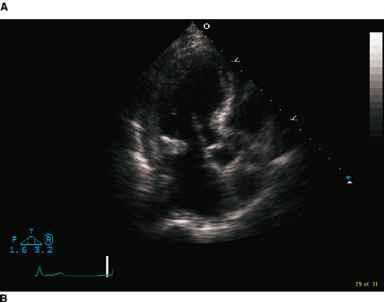 TTE due to the far field nature of the mitral annu-lus resulting in suboptimal images. Figure 7.9. Caseous calcification at the mitral annulus can mimic annular calcifica-tion.The large, circular, echodense mass with echolucent centre is shown in the transthoracic parasternal long axis (A) and apical long-axis (B) views. atrioventricular groove . Surgical and pathological inspection reveals the contents to be a pastelike material which microscopically contains calcium and lymphocytes but no infectious organisms . Clinical correlation is essential when confronted with this entity. Aortic pseudoaneurysm has a propensity to affect the posterior aortic root and can be identified as an echo lucent space (Figure 7.10). Color flow imaging shows only low velocity to-and-fro flow within the pseudoaneurysm. A fistula is a communication with flow between two cardiac chambers or great vessels [29,32]. Figure 7.10. A large echofree cavity posterior to the aortic root in the transthoracic parasternal long axis view. 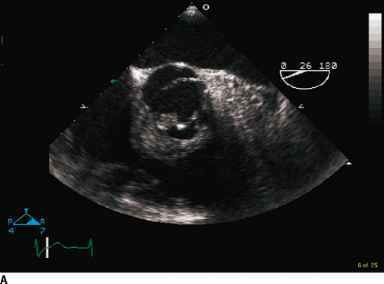 Aortic pseudoa-neurysm is usually not well seen on transthoracic echocardiography. Figure 7.11. 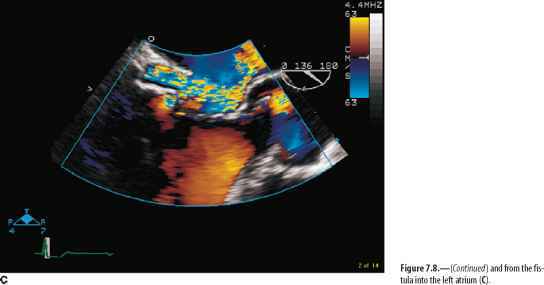 Turbulent flow within an echolucent structure at the mitral annulus suggestive of a fistula on transthoracic echocardiography. have perivalvular complications should undergo TEE to assess the extent and anatomic relationship of the abnormalities in relation to the adjacent cardiac structures. 100%. Adhering to the requirement for echolu-cency to define abscess can result in false negatives, particularly in the early stage of periannular infection . Serial TEE evaluation of periannu-lar infection in patients managed medically has shown that early abscesses appear as abnormal thickening of the aortic root which subsequently cavitates (Figure 7.6). Therefore echolucency is a specific sign for abscess but may not be present in the earliest stages of abscess formation. 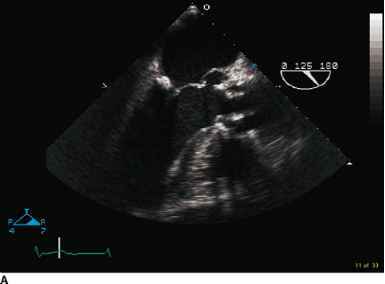 In situations where abscess is suspected but the only finding is abnormal wall thickness, repeat imag ing with TEE may document the development of an echolucent cavity, thus increasing sensitivity to detect this complication while avoiding false positives due to non-infectious causes of increased aortic root thickness. On TEE an aneurysm of the mitral aortic intervalvular fibrosa demonstrates systolic expansion and diastolic collapse of the interannular zone between the anterior mitral leaflet and the aortic valve  (Figure 7.7). Color flow imaging allows the identification and localization of holes and fistulae that may be present within the aneurysm and result in connection between LV and LA. In some cases such fistulas or holes can occur without an aneurysm, typically as a complication of aortic valve IE (Figure 7.12). In the series by Karalis et al., these complications and fistulas were correctly identified by TEE in all seven cases but by TTE in only one case . Figure 7.12. 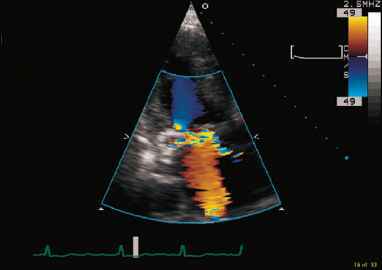 Large vegetations involving the mitral and tricuspid valves on trans-esophageal echocardiography (A). Color flow imaging shows the left ventricle to right atrium fistula. with periannular abscess, TEE offers higher accuracy and more detailed imaging and is therefore recommended in all cases of known or suspected perivalvular complications. 1. Perivalvular abscess is a dynamic process and is the precursor of perivalvular abnormalities such as pseudoaneurysm and fistula. 2. 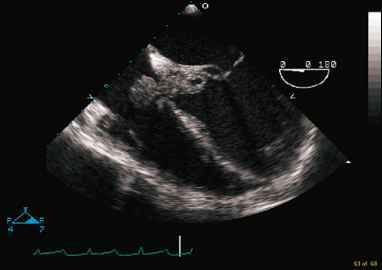 TTE can diagnose aortic root abscess but rarely diagnoses mitral abscess. 3. TEE is more sensitive and specific in detecting periannular abscess, aneurysms, and fistulas. 4. Patients with periannular abscess have high short- and long-term morbidity and mortality despite surgical treatment.